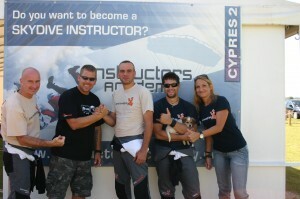 We give a big applause to the Greek skydiver and AFF-I Konstantinos Livanos for passing his tandem instructor course which was held at Greek Freefall Club in Greece under the lead of Marcus Laser. Costas has been trained according to the USPA syllabus with the manufacturer system UPT as well. He managed to show the correct progression and completed sucessfully his evaluation. He is now ready to bring any tandem passenger up in the air! Congratulations from us all!